The Completion of a Preventative Maintenance Program is just four easy steps away. If you are avoiding preventative maintenance, you're only asking for increased downtime, lost revenue, expediting charges, and a more stressful work environment for everyone. 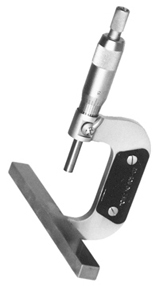 Today, most ISO and QS-9000 quality systems require semi-annual or annual inspections of your molding machines. Are you in compliance? Services For Plastics, Inc. employs a knowledgeable and experienced team of engineers who have more than 150 years of service and technical knowledge in the molding industry. Never measure a barrel or screw again! Our on-site measuring team will come to your facility and carefully inspect the barrels and screws on your molding machines. 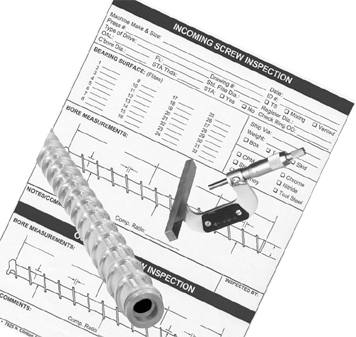 You will receive a comprehensive inspection report showing any possible wear patterns and suggestions with regard to repair or replacement of your screws and barrels, if necessary. Avoiding preventative maintenance can only lead to increased downtime, expediting charges, and lost production. In other words, if you recognize a potential problem and do nothing, it will cost you considerably more to fix the problem at a later date. That is where Services For Plastics, Inc.'s Predictive Maintenance Program can help. We will design a schedule to eliminate the guesswork of determining when your injection unit will wear out. During preventative maintenance visits, we will clean and inspect your units and determine wear that constitutes replacement or repair and make recommendations based on the analysis. 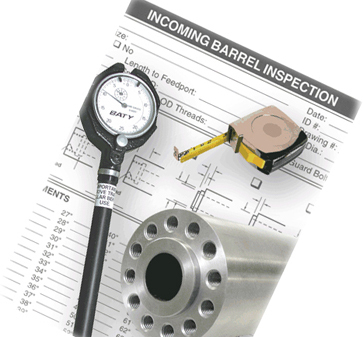 If you would rather inspect and measure your barrels and screws according to your schedule -rather than waiting on a service tech- Services For Plastics, Inc. has all of the necessary components and will train your maintenance team to perform the essential procedures necessary for you to instill a complete preventative maintenance program. Save valuable time and money with a comprehensive Preventative Maintenance Program. comprehensive Preventative or Predictive Maintenance Program.